Cool! But out of wood?? Oops, I meant the French Adventure. It stopped at the parkour description!! I stopped because it would have given away too much information about Book #3. I'll finish once that one's out! BOOK 3! I have been desperately reading all of Scott westerfields wonderful novels (uglies, Pretties, specials, Midnighters trilogy,) so that i will not die of must-read-a-better-book-syndrome. that is cool, but what IS IT with criminals building beautifl palaces? remember, the hippo mansion? I also just finished reading Hazel's award winning story-It was really great! The only bad part was that it ended too soon, haha. cool! structurally unsound buildings AND a third book? By the way, what's the French Adventure? It's a series of blogs by Ananka about her trip to Paris and visits to the catacombs which she *cough* is working on. Kind of like the Columbia Conspiracy. Wow. 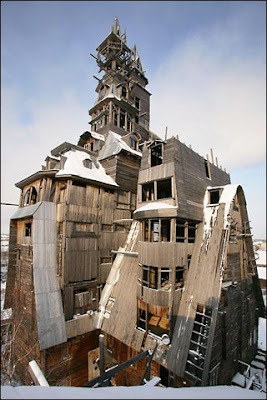 That looks... like something out of a Miyazaki movie. And he LIVES in it? Sorry Kirsten, but I think he's not exactly the brightest man in the world. Book #3!?! Thank you! I can't wait for it - when it it coming out??? I hope VERY soon. I totally agree with you!!! I think this building is a piece of ART!! Oh, did you read the Post a couple of weeks ago about the Gambonis or Gambinis or something? They arrested a whole "family" of thieves, and italian gangsters. Unless the "...Post is just trying to sell papers..."-Ananka, Empress' Tomb. Why do people wanna take it down??? And Russia is really cold, houses don't catch on fire that easily.. BOOK THREE!?!?!?!? WHEN DOES IT COME OUT!?!?!?!?! (*A*)<8 Could you at least tell us what the title's gonna be?? o^-^o Thanks!! What did he do with the extra eleven floors? I've always wanted to build my own house by hand. Now I know it can be done. That is definitly a work of art. I can't imajine why people would think otherwise.